So two guys attacked a church in France today, beheading a priest before being shot by police. That alone seems almost normal at the moment. But there is one thing that has become another part of the normal routine that keeps sparking my interest. According to some sources, the attackers forced the priest to kneel down and the filmed his decapitation. So it seems just a matter of hours, before this material is available in some dark corners of the Internet. Some time ago, it seemed as if the measurement for the success of a terrorist attack was the body count, the number of people killed (and to a lesser extend the number of those wounded). Maybe that is still somewhat the case – and the number of people killed and wounded has definitely a clear relationship to the number of front pages filled -, but to me there seems to be a shift. 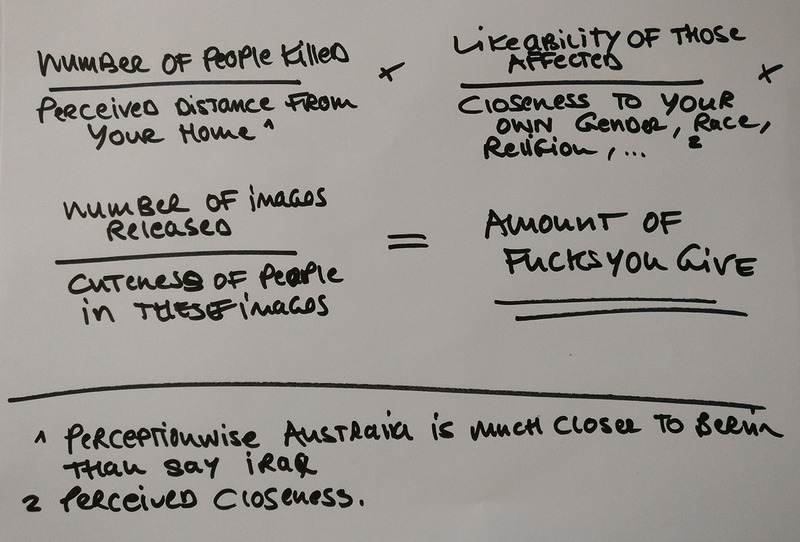 Today, the measurement for the success of a terrorist attack seems to come mostly from the images it produces. Otherwise two dead terrorists for one dead priest would not sound all that successful. But images become more and more important and therefore more and more powerful. It is just a matter of time, when the first terror attacks are streamed live. So far this has only happened in the aftermath of these events, but tools like Facebook Live or Periscope make it seem to be the logical next step. I guess the war in Syria would already be streamed live, if the mobile Internet in this war torn nation would just not be that bad. But for me the question goes deeper. If it is true that images become the deciding factor (even though I make the argument here that they are, of course I can not be sure) – So if this is true, could we argue that this is then something we could call “image primacy”? With this I mean that people are not killed to be killed, but rather they are killed to produce images and therefore produce “news”. Otherwise, why bother killing a 86 year old priest? Something I have already argued for, when collecting images taken by snipers, while killing their victims. The victim does not seem to be important anymore, but the image itself seems to matter. That way it does make perfect sense to kill a priest inside a beautiful old church. It is the perfect setting to produce images that stand out.